I got this piece a few weeks ago at a garage sale around the corner from our apartment. I went in the afternoon and couldn’t believe it was still there. I knew exactly what I wanted to do with it. 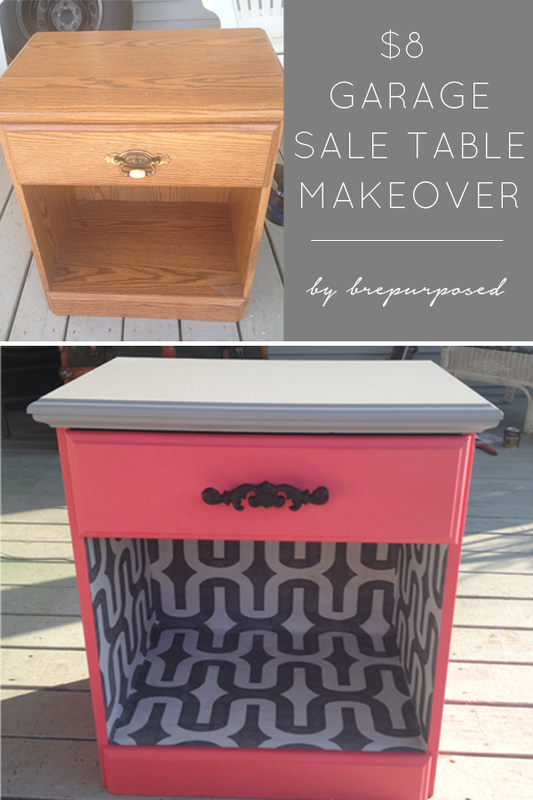 So let’s talk about how I transformed this $8 Night Stand Table! I’ve seen a few posts on Pinterest with tables like this where you wallpaper the inside. That was my original plan; however, when I started looking for wallpaper I realized how expensive it was and how hard it was to come by these days in a pattern that is modern. I did some research and found a much cheaper and probably easier alternative. Fabric and mod podge. This combo works wonders and I will definitely be using it in the future. It took me a while to pick my colors. I had grey in mind and originally was thinking a mint color for the paint. After some googling, some pretty coral pieces caught my eye and I was hooked. Being new to all of this wood working stuff, I asked my brother what kind of prepping this piece needed before I started to paint. He said just some light sanding and I should be good to go. I figured this was the time to buy my first power tool 🙂 I went to Home Depot and got myself a hand sander. I was pretty excited about this sucker and couldn’t wait to use it. 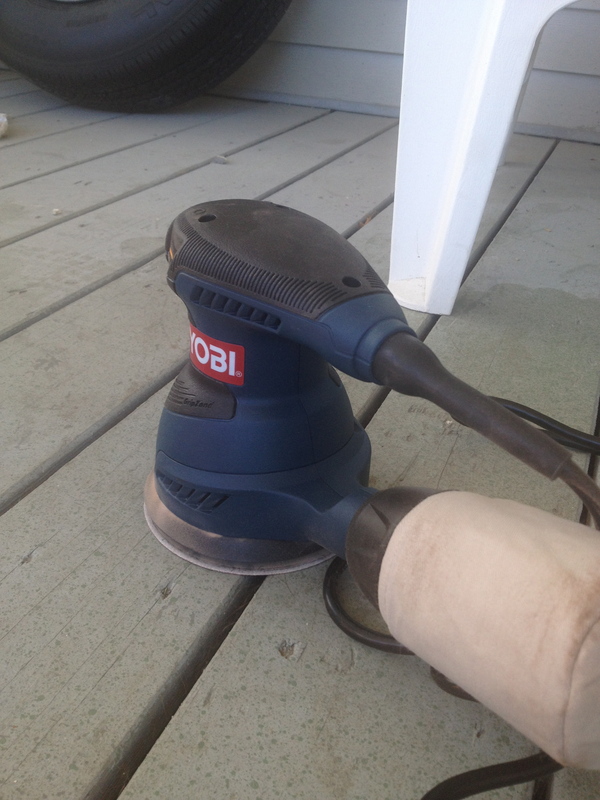 Power tools are awesome. After sanding all the large surfaces and wiping it clean, I was ready to paint. 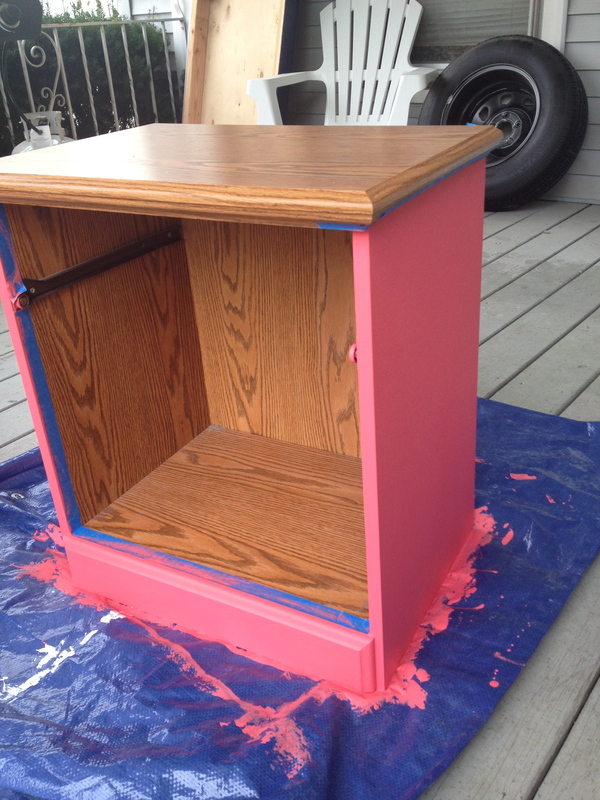 I had to do about 3 coats for the piece to be evenly covered. 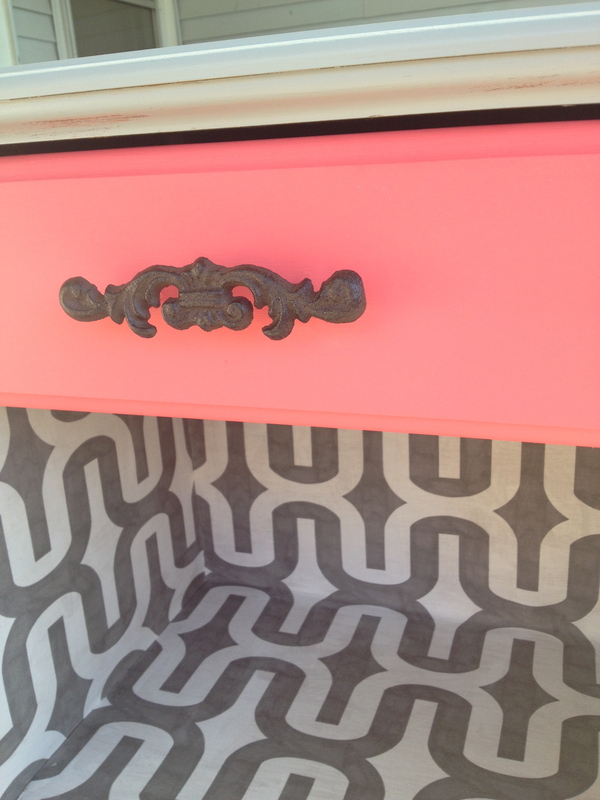 The color is called Pink Salmon by Glidden. I bought some new hardware at Hobby Lobby which turned out to be quite the process to screw in. With some help from the hubs and a friend of ours, they helped me tackle the drawer pull and we were good to go. Next step, fabric! I thought this process was going to be much more difficult than it actually was. The hardest part was actually cutting the fabric so the ends were straight. I used the divots in our porch as a guide 🙂 Once they were cut, I mod podged the inside and used an old ID card to smooth it all out. I cut one big piece for the back and bottom, and two separate pieces for the sides. I put another layer of mod podge over top all the fabric to create a hard finish and help keep it in place. This works as a great sealant and will help protect it from getting dirty. It’s a little scary at first, but don’t worry, it dries clear! My original plan was to leave the top with nothing on it, but I wasn’t sold on the way it was looking. I happened to have some left over grey paint from when I painted our bathroom and it was a perfect match. For $8 this piece was definitely worth it! I’m proud to say that I have sold this to a young woman on Craigslist – my first sell! I hope it’s happy in it’s new home! Hi! 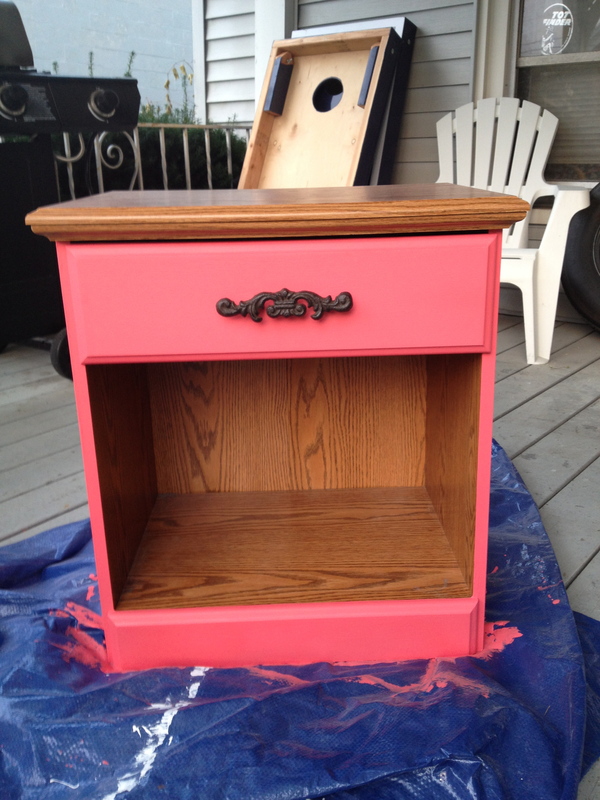 I just saw the nightstand you did and I absolutely love it! I want to do the same thing with my daughters nightstand and I was curious if the nightstand you had was made from real wood or pressed wood? Mine is pressed and I was wondering if I sanded it if the paint would stay on. I’ve heard that you can’t sand and paint that kind of wood, that’s why I was wondering. 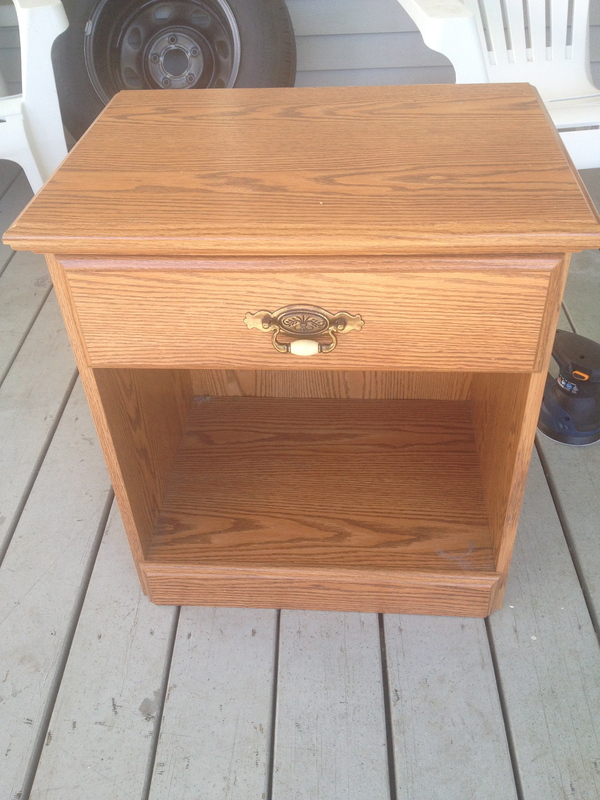 I absolutely love your work and would like to re-do my nightstand I bought recently from a fellow student. I am a student and am looking for something low-budget. Can I send you an email with pictures so you can suggest what I can do with it? Hers a piece I just finished using chalk paint and umber wax. Distressed of course and solid wood sanded down, stained and polyd. Looking for someone that needs a garbage can holder, dirty laundry hamper or potato bin. Sorry if I missed it, but I LOVE this grey color and was wondering what brand and color it is. Cute!!!!! I know you said you used Glidden paint but I’m wondering what finsh? Flat? Semigloss? Satin? Chalk? I’m wanting to do my first dresser with matching nightstand in paint with decoupage drawer fronts but don’t know what paint I should be using. Hey! Is this for sale? No I’m sorry it was sold a while ago! Love the color. What is the coral color you used?? I’d love to know if you wouldn’t mind Sharing. the coral color is perfect! Would you mind sharing what it is?? Love this! Just wondering what kind of paint and what colour this is? I am SO impressed with your work. I have a piece that is dark wood stained and want to have it fit into my beach house but have no idea where to start??? It is real wood but the shiny brown finish it has got to go! I would appreciate any help, suggestions, etc. from you to help me get started. I’ve never done anything like this before but have other pieces that could use this technique too. Thank you in advance! Hi Sue! Thank you so much for the sweet compliment 🙂 What type of look are you going for? 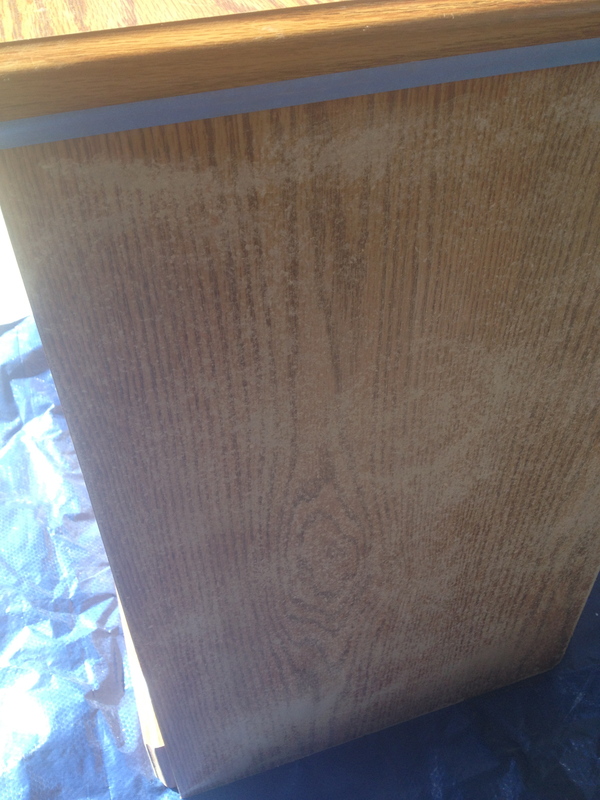 Do you want to keep the wood showing, or paint it? Feel free to email me directly with more specifics! That sounds lovely! Definitely don’t be scared! It’s a learning process but if you mess up you can just sand off the paint and start again 🙂 You can do it! Thank you! I’m anxious to start my project! OMG – love it!! Great job – thanks for the ideas. Can you please tell me if you did any treatment to the fabric once glued to the night stand? Something that could help get it clean? Just regular fabric from JoAnns! did you paint it with a brush or spray paint? Flatinish or semi gloss or eggshell? It looks great. 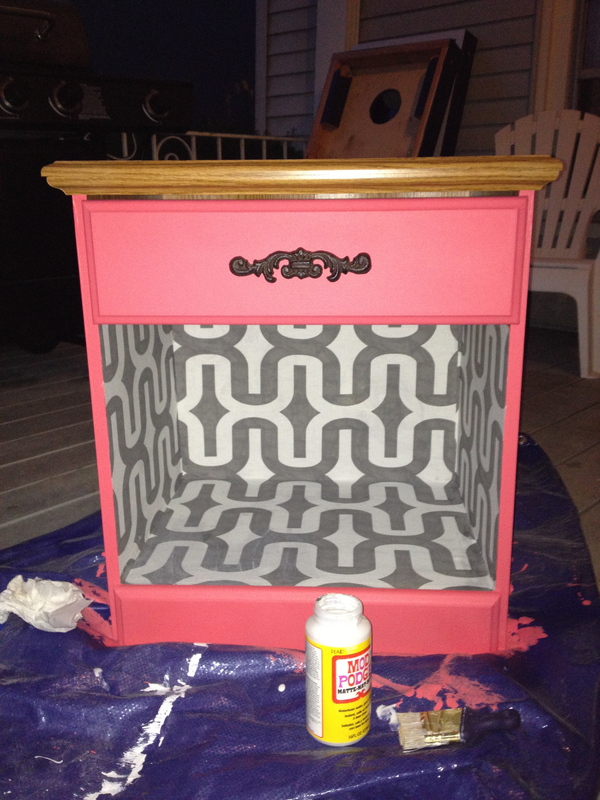 I have this exact stand at home and you gave me an idea of how to redo it! Hi Tanya! I used a paint brush and it was a flat finish 🙂 Good luck with your table, I’d love to see how it turns out! I love this coral color! Could you tell me the name of this color? Absolutely love this! I also live in a small apartment and have found my front porch and patio are my work spaces. Can’t wait to see more! 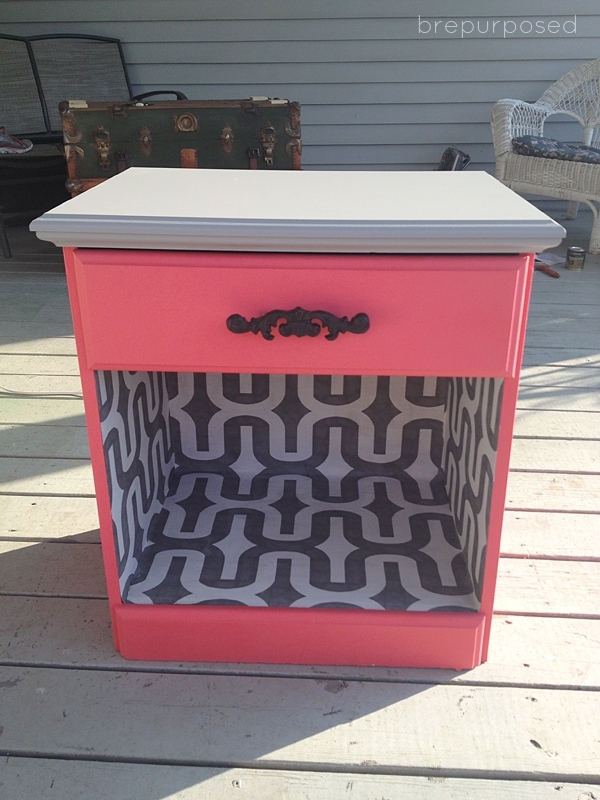 The nightstands in my bedroom are built similar to this one and are begging for a makeover. I’ve never seen the wallpaper/fabric on the inside idea, but I think I’m going to try it! Thanks for the inspiration! !